This is a fun miniclip game that you can play with many others from around the world. This puzzle game inst complicated to learn, but challenging to master. The goal is to place vines in between the rock tiles and the last one that places a vine which will surround a square will capture it. 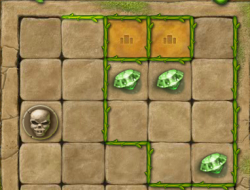 Start off by placing them wherever you can without giving the opponent chances to conquer tiles. Later in the game it will become more difficult as not many spots will be left open. Do your best to capture the ones with the diamonds on them as they are worth one extra point each, but care not to be the one getting the skull or it will cost you a point. Boxo 10.00 between 0 and 10 based on 1 votes.